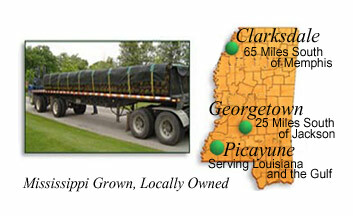 Oasis Sod Farms - Delivering top Quality Turf Grasses to Mississippi, Tennessee, Louisiana and surrounding areas. Sod grown right from the start. Grown on some of the best soil in the south and guided by some of the country's leading specialists, turf from OASIS SOD FARMS gets one of the best beginnings in the business. Specializing in six diverse, quality grasses, OASIS SOD FARMS maintains one of the highest quality control programs in the industry. Strict attention to irrigation, regular spraying for weeds and insects, and the highest quality fertilization possible all help to insure our customers of the best start possible to years of beautiful turf. When you buy from Oasis Sod Farms, you are buying directly from the grower, giving you the highest quality in turf grass available. Our record for service and reliable delivery is un-matched. Maintaining a fleet of trucks at each location as well as a complete crew, available for any grading, sprigging services, or sod installations, we can accommodate any special needs you may have. Don't want to wait for your turf grass to be delivered? Oasis Sod Farms offers customer pick-up at our Clarksdale, Pinola and Picayune locations. Contact us to place your custom cut order today!